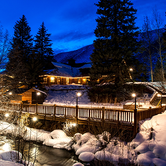 Our last travel column was on my Top 10 ski resorts in America. But America's hardly the only place where the weather is cold, the skiing is cool, the nightlife is hot, and the winter-wonderland scenery is breathtaking. In fact, it's just one of many places like that! Here are my Top 10 international (non-U.S.) resorts. I look forward to hearing your opinions...and your own favorites! #10 - AKAKURA ONSEN, MYOKO KOGEN, JAPAN - This may seem like a surprise entry on my Top 10 list. But it's a little gem! 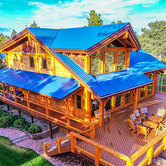 This resort, like many of the better-known ones, has picturesque ski lodges, impressive mountains, and good facilities. But it doesn't have the crowds you find at more publicized international ski destinations; most of the people you'll see on the slopes will be Japanese. Akakura Onsen has a lot to recommend it. For one thing, it was Japan's first international ski resort. For another, it has the longest ski run in the country. And, since it hasn't yet attained the international "panache" of the big European resorts, you're close to picturesque villages where centuries-old traditions and building-styles still reign. #9 - CORTINA D'AMPEZZO, ITALY - The jagged, sky-piercing peaks of the Italian Dolomites, bordering Austria, offer some of the most spectacular mountain scenery in the world. 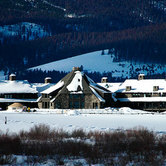 This resort features skiing nearly all year long, because of the height (and, subsequently, the amount of snow) of some of the mountains. Cortina d'Ampezzo is in the Veneto Region. It makes no bones about being one of Europe's most exclusive - hence, expensive - resorts. It's a beautiful village, with a museum, art galleries, movie theater, indoor tennis, and plenty of atmospheric restaurants and hotels. There are 47 ski lifts here, and going up to 10,653 feet. And there's also tobogganing, bobsledding, ice skating, and ice hockey. #8 - VAL THORENS, SAVOIE, FRANCE - Val Thorens, located in the scenic Belleville Valley of the French Alps, is the highest ski resort in Europe - 7,600 feet. It also holds the title of largest ski area in the world, with some 375 miles of trails. It's a pedestrian-friendly type of place, with no parking allowed in the streets...and that makes the interesting village even more worth wandering. More superlatives? It's also got the largest toboggan run in France. And - the operative word here is "France" - it's become a real "foodie" spot, as well, with over 60 restaurants (and 40 bars). 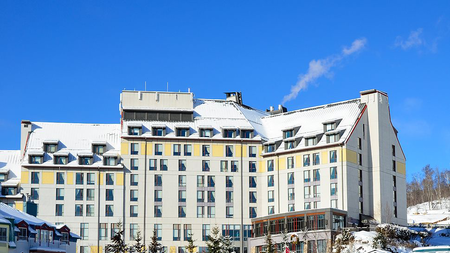 The Fairmont Hotel in Mont Tremblant. 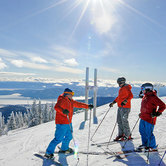 #7 - MONT TREMBLANT, QUEBEC, CANADA - You don't necessarily have to go to Europe to have a European-style skiing experience. 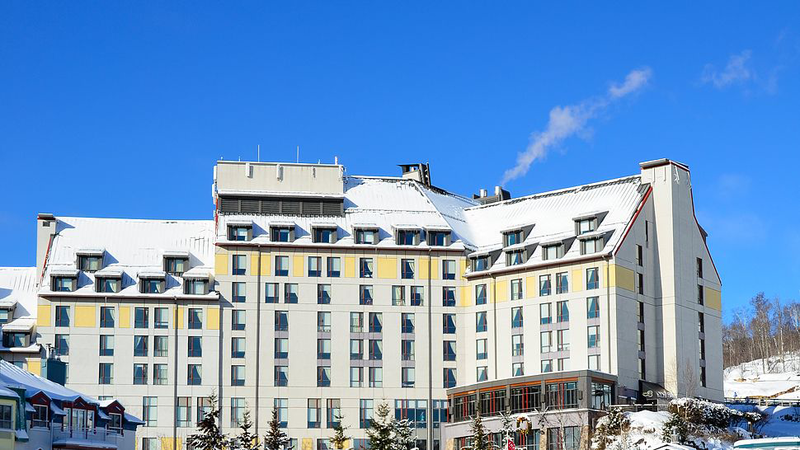 The scenic resort village of Mont Tremblant looks very much like its cousins in the French Alps. And, with its French-Canadian ambience, feels very much like them, too. The ancient Algonquins called Mont Tremblant Manitonga Soutana - "the mountain of the spirits." As you schuss down these challenging slopes, through magnificent terrain, you may well feel those spirits. There are snow parks where the more-extreme types can have their fun. There's a wide variety of accommodations. And there's a pedestrian-friendly village where the lights - and the fun - stay on late. #6 - CHAMONIX, FRANCE - Chamonix is an old favorite of mine...and of a lot of other skiers, as well. And why not? It's one of the largest ski resorts in France. It's also one of the oldest resorts in France, and it hosted the 1924 Winter Olympics. The surrounding region boasts some of the most spectacular scenery - and skiing - in the French Alps. Chamonix is also a great place for ski de randonnée (ski touring), snowboarding and heli-skiing. 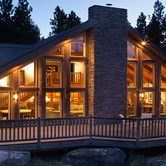 And even if you're not in the mood to ski, there's still plenty to do here. 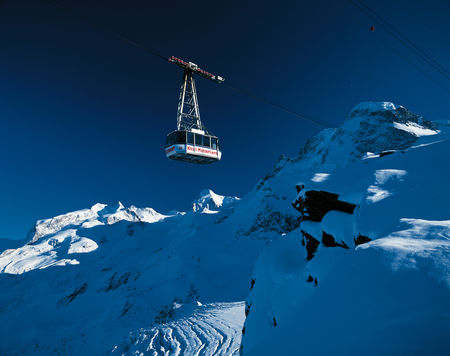 You can take Europe's highest cable-car up Aiguille de Midi, for stunning vistas of the mountains. And Chamonix is known for its vibrant après-ski atmosphere, as well. 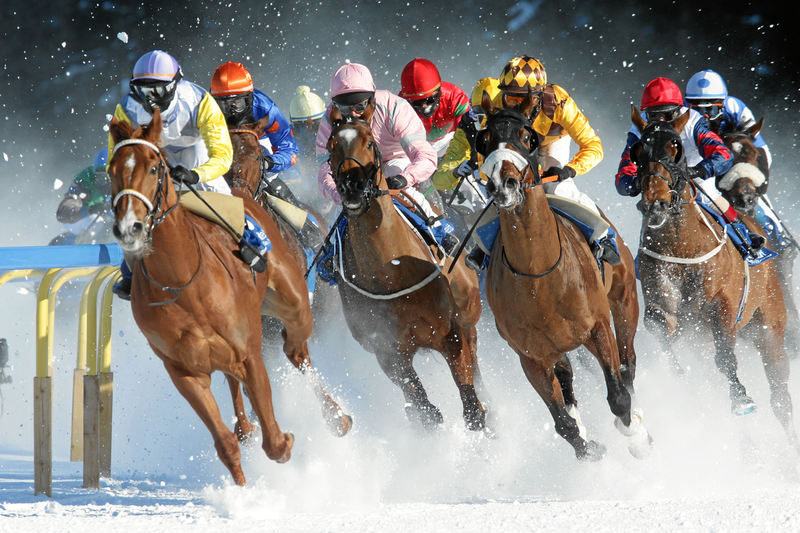 In St. Moritz.... horse-racing in winter! #3 - CERVINIA, ITALY - On the other side of the Matterhorn ("Monte Cervino" in Italian) from Zermatt, Switzerland, is Cervinia. This town isn't as beautiful as Zermatt, and it lacks the cache of the fancy European resorts...and that's part of its charm. It's less expensive, less crowded, more authentic, has great Italian food, and you'll mingle with as many local residents as you will international travelers. (If, however, you'd still like a quick shot of "cache," it's only a short drive to Zermatt.) And, as a bonus, Cervinia has a run more than 12 miles long - one of the longest in the world. And you can ski here almost all year long. Zermatt's Matterhorn takes your breath away! #2 - ZERMATT, VALAIS, SWITZERLAND - Zermatt lies at the foot of the Matterhorn, at 14,692 feet, perhaps Europe's most majestic mountain. The Zermatt region, with 224 miles of slopes (and mountain railways all over the place), is Europe's largest (and highest) summer skiing region. Small wonder it's called "Matterhorn Glacier Paradise." Among the "extras" here: Gornergrat, a cog railway going up to 10,135 feet, and offering a spectacular panorama of the Alps. The Matterhorn Museum, which houses the equipment used during the first ascent of the Matterhorn in 1865 (which ended tragically). And Gorner Gorge, which the steady-of-nerves can traverse over narrow bridges and steps, as well as a fixed-rope route. #1 - WHISTLER, BRITISH COLUMBIA, CANADA - If you didn't know much about Whistler before the 2010 Winter Olympics, you probably did afterward. This scenic village was the site of all the skiing events. (And the site of some great times after the skiing events!) 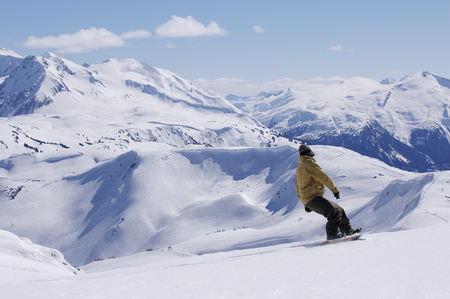 True skiers, though, have known for years that the Whistler Blackcomb area offered some of the best skiing on Earth. About two hours north of Vancouver, this region resembles a Currier & Ives postcard in winter, with the snow-capped mountains and deep-green forests of British Columbia's Coastal Range. One of the best ways to see them is by taking the Peak 2 Peak Gondola. 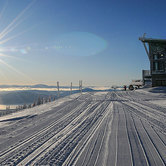 It's the world's longest free-span between ropeway towers - 1.9 miles - and connects Whistler and Blackcomb mountains. And when you ski in Whistler, you'll be skiing in an active bear habitat...so keep your eyes open! Well, these are my favorites. What about yours? Let us hear from you. Here's your chance to tout your favorite!